Tamara Bodrug: "Being a foster parent is a fulfilling job"
"I love children. I like taking care of them and having them around. I like the profession of foster parent, it make me feel self-fulfilled!". Life granted her four children, but, as it often happens, they grow up and decide to conquer the world, while the parents remain alone in their house and the household they created to be enough for all. This is what happened to Tamara Bodrug from Contratesti village in Ungheni region, who decided a year ago to become a foster parent and offer care and love to many children deprived of family affection. Mrs. Bodrug has taken 5 children in placement since she became a foster parent. She learned about this service from a radio program, and she was very glad when she was told that she was eligible to become a foster carer, as she was under 60. They had a family council and the entire family decided to apply. Two orphan children - a boy and a girl - are raised now in the Bodrugs family. “They are brothers, and they are very kind and obedient, and great helpers” – Mrs. Bodrug is proud to describe the children. She teaches good things to the children, offers them good advice, so that they have a better life, especially considering that they come from a residential institution and haven’t known what family love was before. The children are very well in Bodrug family, they found common language with the family’s biological children, along with whom they learn new life skills every day. The children themselves acknowledge they would never have been able to learn these things if they stayed on in residential care, where, according to the regime, the activities were always the same. The children also say they feel lucky for not have been separated, and that their life became much better. They also say there is very big difference between a residential facility and a true family, because you are free in a family. As for the relations with their peers, the children already managed to make friends with the neighbours. Learning and education are the most important things in the foster parent’s family. 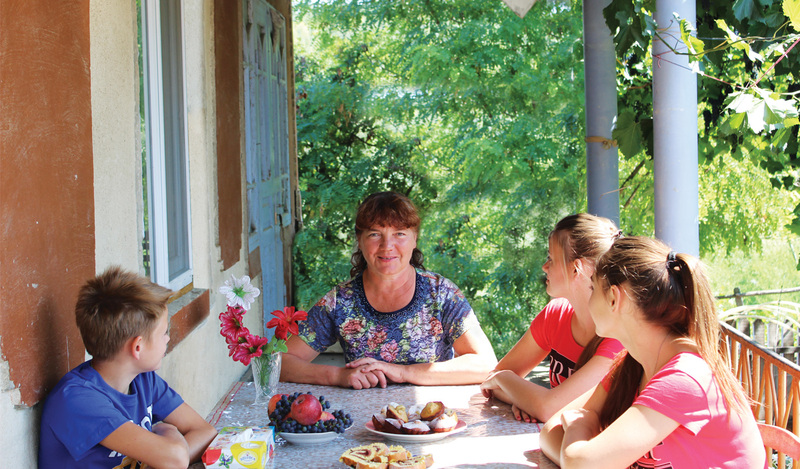 Mrs. Bodrug is very keen to make sure the children pursue education and learn a profession, so that they do better in life and are able to create and support their own families when they become adults. Talking about all children she had in care, Mrs. Bodrug is searching in the mobile phone, where she has lots of memories in photographs and video files. Each of them keeps unforgettable memories of beautiful moments lived along with her children – merry songs, the first trip… lots of emotions that can hardly be described. Mrs. Bodrug is fond of photography, so when children leave the placement, she offers each of them a disk immortalizing memories of all happy moments lived together. The foster parent is sure that those who work in this service offer to children conditions of safety, spiritual warmth, affection and love, at least for the period of their placement.